I have quite a few projects that I would like to finish before I start any more knitting projects. A few of them have been in the works for a long time! Now that I don’t have school to occupy all of my time, I can focus on getting them done! The first on the list is the Peaks and Valleys scarf. The pattern is on Ravelry. I started working on this one over a year ago. I spun the yarn from some fiber purchased from Dicentra Designs. I adore this color combination and think that it looks great with the pattern. I spun it very thin and Navajo plied it to keep the colors together. 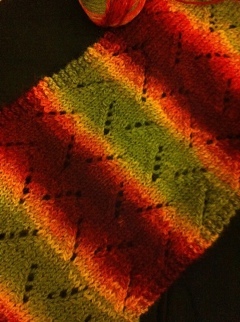 I started The Traveling Woman shawl back before October 2010. I was going to use it as a wedding shawl, but the weight seemed too heavy for a wedding shawl so I decided to put it on hold. The yarn is a gorgeous merino silk blend. I think it is from Louet, but I can’t remember for sure. It’s been a while since I spun it. 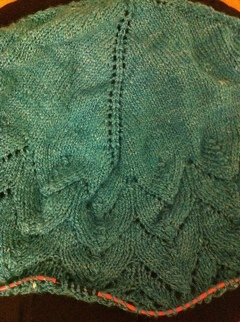 And this last one is from Ysolda Teague, her Snapdragon Flip-Tops. 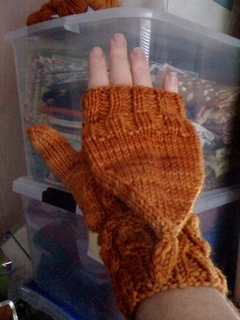 I started these just after I made the Snapdragon Tam, but only got one finished. Just like a pair of socks, I can only ever seem to get one done at a time. But it’s on my list of things to finish this summer!